CPL - Programs & Events - Workshops - High Meadows School, Inc. The Center for Progressive Learning designs authentic opportunities to promote progressive learning for parents and professionals though many different programs and events. Our Workshops and other events offer opportunites to discuss, engage and learn with peers and well-known and experienced experts in education and child development. Interested in hosting a workshop at your school? Learn More! Join High Meadows educator counselor Sue Amacker, MA, LPC, NCC in learning how mindfulness can support well-being for students and teachers. The workshop will highlight bringing the benefits of mindfulness to our classrooms, empowering children’s self-management and regulation, and practicing mindfulness as an adult. How do educators increase student engagement, prepare students for the future and develop student agency? Come learn how an inquiry pedagogy and classroom culture of curiosity has the capacity to take student thinking to a higher level, engage all learners, and encourage conceptual understanding and connections between skills and knowledge of multiple disciplines. High Meadows teacher Kerri Irwin has fifteen years of teaching experience in private, public, and Montessori environments. Gail Albert has 16 years of classroom experience in Reggio-inspired classrooms. HMS teachers Rebecca Drage and Shannon Hostetler have a passion for nature-based learning. Rebecca has been a HMS teacher and camp counselor for six years, working with children ages 5-13. Shannon has 22 years of teaching experience in early childhood education in both public and private schools. High Meadows teachers Gail Albert, Libby McCutchen and Linda Wise have a combined 40 years of experience teaching young children. In a fast-paced, rapidly changing world, how can teachers insure that the content of instruction today will serve our students in the world of tomorrow? How can we prepare students to live, work and thrive as global citizens in a world as yet unimagined? In this course we will venture beyond curriculum, standards and benchmarks to explore the tools and techniques that support the greater purpose and promise of education. Join your fellow educators in taking advantage of the opportunity to learn, practice and apply transformational methods to build a culture of thinking in the classroom. Join High Meadows School art teacher and STEAM integrator Brenda Major as she highlights strategies to weave thinking skills and attitudes through the fabric of all content learning. Brenda has a BA and MA in art from Georgia State University. Discounted pricing for registering 4 or more. High Meadows teacher Annie Swanlaw has 13 years of experience teaching children and writing. M.Ed. with focus on literacy, literacy coach, and graduate of Teachers College, Columbia University. How can teachers activate their intellectual empathy to build active, compassionate, responsible, global citizens without being political? Learn how to layer learning to teach differently, not teach more. In this course, we will support teachers acquiring the skills and dispositions to facilitate classroom learning where students become aware of the world, engage in current events and issues, and are involved in their communities. Foundational skills of reading, writing, and questioning work alongside social-emotional skills of empathy building, open-mindedness, and reflection to develop critical consumers of knowledge. Presented by Vivien Rosa-Vaccarelli and Kirsten Fournier. High Meadows teachers Vivien Rosa-Vaccarelli and Kirsten Fournier have a combined teaching experience of 23 years. Vivien holds a B.A. in Art History from Barnard College of Columbia University and a M.A. in Spanish Language and Literature from Middlebury College. Kirsten holds a B.A. in Child Development and Education from Vanderbilt University and a M.ED. in Reading Education from the University of Maryland at College Park. How do educators increase student engagement, prepare students for the future and develop student agency? Come learn how an inquiry pedagogy and classroom culture of innovation has the capacity to take student thinking to a higher level, engage all learners, and encourage conceptual understanding and connections between skills and knowledge of multiple disciplines. Presented by Kerri Irwin and Martha Lee Thwaite. High Meadows teacher Kerri Irwin earned her MAT degree in Early Childhood Education from Oglethorpe University. She has fifteen years of teaching experience in private, public, and Montessori environments. Martha Lee Thwaite holds a BA in Early Childhood/Elementary Education from Converse College and a MEd from Columbia College in Divergent Education. She has 33 years of teaching experience in Independent Schools and has completed three courses through the Stanford dSchool. "Waking Up White is the book I wish someone had handed me decades ago. My hope is that by sharing my sometimes cringe-worthy struggle to understand racism and racial tensions, I offer a fresh perspective on bias, stereotypes, manners, and tolerance. As I unpack my own long-held beliefs about colorblindness, being a good person, and wanting to help people of color, I reveal how each of these well-intentioned mindsets actually perpetuated my ill-conceived ideas about race. I also explain why and how I’ve changed the way I talk about racism, work in racially mixed groups, and understand the racial justice movement as a whole. Exercises at the end of each chapter prompt readers to explore their own racialized ideas. 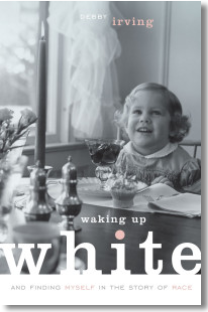 Waking Up White's personal narrative is designed to work well as a rapid read, a book group book, or support reading for courses exploring racial and cultural issues." A learning experience of three gatherings to discuss the book, education, and share perspectives. What is progressive education? What makes a progressive learning environment different from more traditional educational environments? If you have ever asked yourself these questions, then the Center for Progressive Learning has the perfect opportunity for you! Please join us for an adult book study around the text Loving Learning: How Progressive Education Can Save America’s Schools. Written by the former head of Park Day School, Tom Little, the book demonstrates the values found in a progressive approach by weaving historical, philosophical and practical stories and examples of whole-child learning. Experience how educators and schools around the nation invigorate learning and promote inquiry by allowing curriculum to develop from children’s innate curiosity and desire to learn. 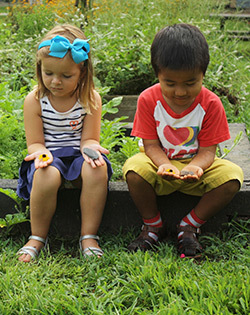 Imagine a classroom where children expand their social and emotional selves by showing care for others; where children learn about fairness, justice and advocacy through play; where children think deeply and differently about themselves and others; where children grow into the very best version of themselves. In this course, we will support creating classrooms where students have significance, belonging, compassion, and empathy. Just as children learn best by doing, this will be an active course with a chance for you to see, try and apply teaching tools and strategies to your daily practice, helping children care, play, think, and grow in the social world of the classroom. Presented by Cari Newman and Jennifer Hannah. High Meadows teachers Cari Newman and Jennifer Hannah have a combined teaching experience of 33 years. Cari holds a B.A. in Religion from Emory University and a M.Ed. in Elementary Education from Simmons College. Jennifer holds a B.S. in Child Education from Berry College and a M.Ed. in Reading from Mercer University. Books are available for purchase ($20) at the school. Email Kate McElvaney with requests and questions. Teach Your Children Well provides research and practical information to support parents in creating a broader definition of success that allows for children’s developmental growth and well-being. 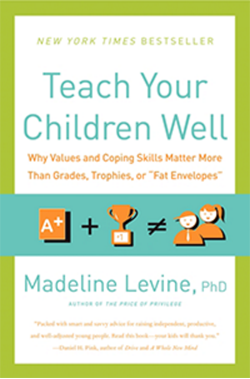 Psychologist Madeline Levine utilizes pertinent research and clinical experience to redefine authentic success at a time when the definition has narrowed to include only high-achieving academic success. Teach Your Children Well is an essential book for parents, educators, and therapists as they guide children in today’s fast-paced world. Books are available for $12 at the school. Email Kate McElvaney with requests and questions. 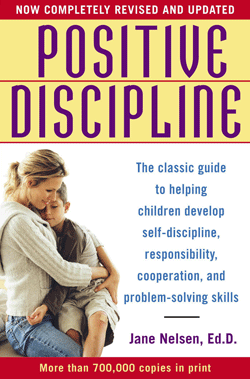 We will focus on non-punitive, respectful methods that will incorporate kindness and firmness into parenting, help parents get to the core of their child’s misbehavior, bring more joy into the home and give parents a sense of accomplishment. 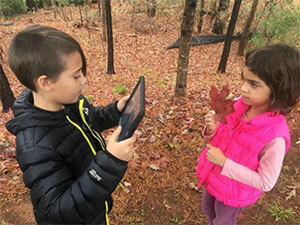 Discover and use apps your child can use to explore the outdoors. Wonder and experiment with device-friendly tools. Share and learn ways other parents are managing screen time. 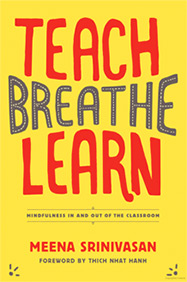 We invite you to join us for a book study of Teach, Breathe, Learn by Meena Srinivasan. Teach Breathe Learn: Mindfulness In and Out of the Classroom provides personal stories, research, and practical advice to support adults in developing an understanding and practice of mindfulness. Adults charged with raising young minds and bodies, whether parent or teacher, will benefit from Ms. Srinivasan’s unique approach to weaving a mindfulness practice into our days and our children’s experiences. Join High Meadows educator Annie Swanlaw and counselor Sue Amacker in learning how mindfulness can support well-being for teachers, parents, and students. The workshop will highlight the power of practicing mindfulness as an adult and how to bring the benefits of mindfulness to children. Two different workshops will be offered in the Summer of 2016. In this course we will support creating classrooms where students have significance, belonging, compassion, and empathy. We will actively explore teaching tools and strategies to help children care, play, think, and grow in the social world of the classroom. In this course we will venture beyond curriculum, standards and benchmarks to explore the tools and techniques that support the greater purpose and promise of education. A blended learning experience that will include 3 face-to-face meetings and an online discussion. What is progressive education? What makes the High Meadows learning environment different from more traditional educational environments? If you have ever asked yourself these questions, then the Center for Progressive Learning has the perfect opportunity for you! Please join us for our first adult book study around the text Loving Learning: How Progressive Education Can Save America’s Schools. 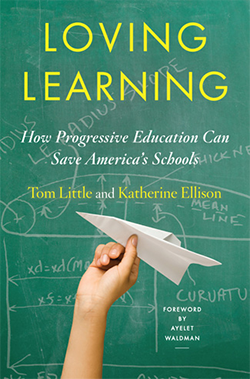 Written by the former head of Park Day School, Tom Little, the book demonstrates the values found in a progressive approach by weaving historical, philosophical and practical stories and examples of whole-child learning. The High Meadows School faculty read this inspiring book over the summer and have been exploring the ideas and approaches in learning groups throughout the year. As educators we recognize the power behind a shared reading for building common understandings, strengthening relationships, and inspiring action. We would love for you to experience this power as well. The Center will have copies of the book for sale. Looking forward to our journey together!